We awoke to Krakow lightly dusted with snow. It’s been a cold, clear day – perfect for the only two items on our agenda. Our main task for the day has been a study of castles. We’ve just been reading David Macaulay’s fantastic book about how castles were built and what all the bits are. 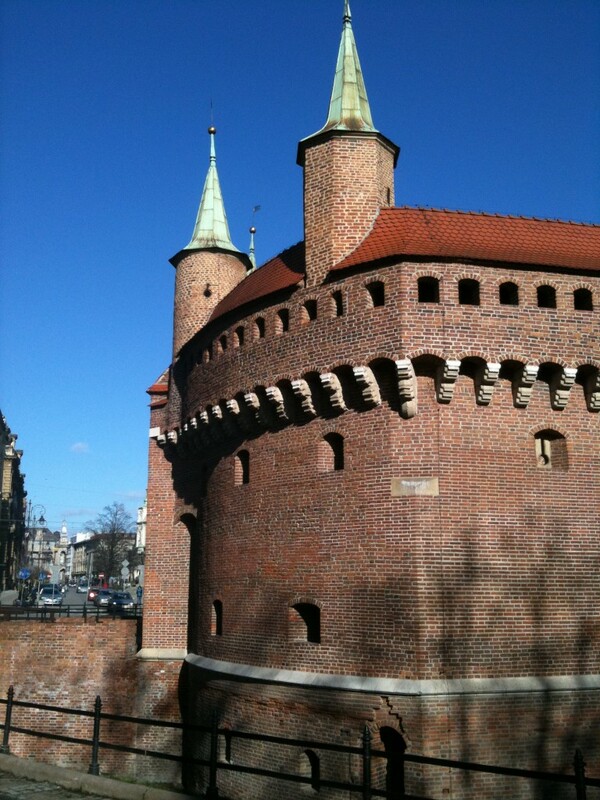 Luckily not 100m from our front door stands the Krakow barbican and city walls – absolutely perfect examples of your basic castle building in action. 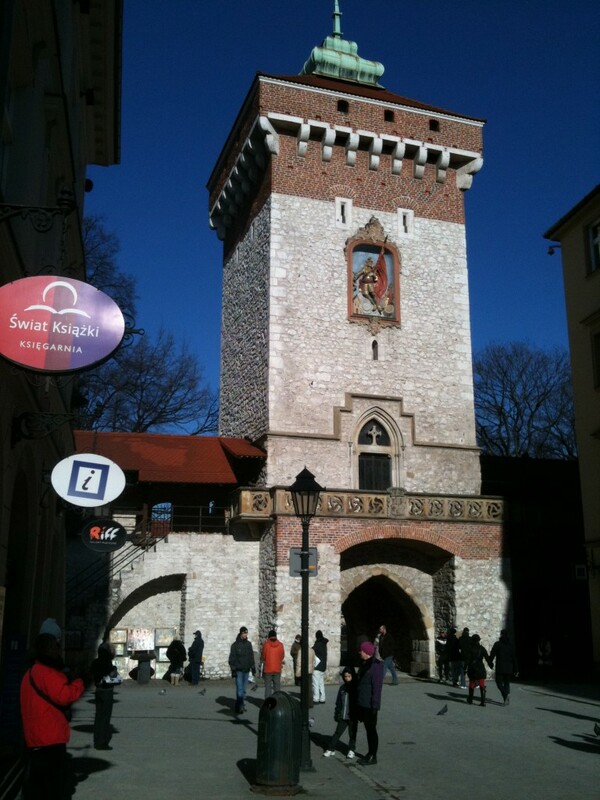 The Barbican was built at the end of the 15th Century as part of a huge complex of fortifications guarding the southern approaches to Krakow. It really is a masterpiece of engineering, as are many of the castles of that time. The northern approaches to the City were covered by the river and a hill atop which sits the palace with its own impressive fortifications. A double row of walls separated by a wide moat joined Barbican to Palace. The moat is now a park and not much is left of the walls, but there’s certainly enough to get a real sense of the scale and complexity of what was built. One question remains unanswered. I’d always understood that arrow-slits were built with a small hole on the outer wall, to present a small target to the enemy, and a wide embrasure on the inner, to allow movement for the archer. We noticed in Akko that the walls there were built the other way around and saw the same here today – the larger side of the wedge faces outwards. In spite of some serious effort at research on the web, I can find no explanation for this. If there are any experts in medieval architecture out there, or even anyone with a creative thought on the subject, we’d love to hear from you. The cold day made for great castle viewing and had us feeling really chilled for the first time since China. That in turn provided a perfect excuse for the other item on our agenda: hot chocolate and polish doughnuts. I would think they would a wider range of angles for their shots out? They could also fire without being directly in front of the slit? Are you sure they are arrow slits? Could they simply be windows? They are definitely arrow slits here – the cross shaped slit is distinctive. And in Akko they were designed for cannons so there was no mistakingntheir purpose. But even if they were windows they make little sense in medieval terms as I understand them – the wedge shape facing outwards channels wind to the slit just as effectively as it would channel arrows. The field of vision should be pretty much the same in either case – the limit is the the angle of the wedge regardless of whether it faces inward ot outward. But the outward facing wedge makes a big target. Frustratingly all the info I can find so far on the web describe embrasures in exactly the way I’ve always understood them. 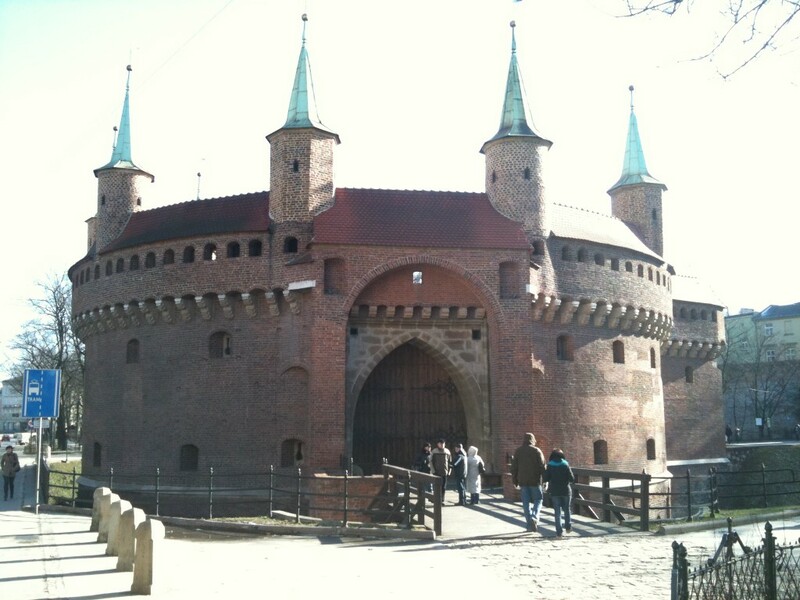 One thought or hint that i’ve been unable to do anything with is that the Krakow castle was built following the “Muslim style” and Akko was built by Muslims.